Congratulations to October Employee of the Month, Melanie Huffman! Huffman is the fiscal coordinator in the Department of Biochemistry and had multiple nominators including Glenda Gillaspy, Karen Dove, and other members of the departmental office. Her nominators called Huffman’s work ethic “exceptional.” Huffman provides valuable assistance to others within the department office calculating salaries, fringes, and figuring remaining balances on various accounts and sponsored projects in order to help faculty facilitate daily financial decisions. She makes herself available to help others figure out the best solution to many different challenging situations.We value her commitment to delivering excellent accountability in our fiscal office and being adaptable and flexible in working towards the goals of our department and individual research programs. “Under her guidance, our fiscal operations run smoothly and efficiently. We all appreciate the opportunity to work with her as her professional manner, coupled with her sense of humor, make her an absolute pleasure to have in the departmental office,” Gillaspy said. Robert E. James, professor of dairy science in the College of Agriculture and Life Sciences at Virginia Tech, has been conferred the title of professor emeritus by the Virginia Tech Board of Visitors. A member of the university community since 1974, James served the dairy industry of Virginia and the nation as an Extension specialist, contributed to scientific and Extension education literature, and served as Extension project leader for dairy science. He taught applied dairy nutrition to undergraduate students, mentored graduate students, and fostered their growth and development for successful careers in industry and academia. He served as the faculty advisor to the Dairy Club and was co-coach of Virginia Tech’s Dairy Challenge Team. James was also instrumental in helping relocate the dairy to Kentland Farm. 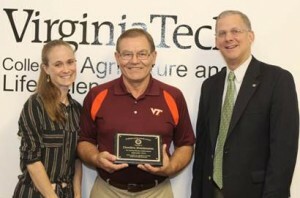 During his career, James was honored with a Virginia Tech Certificate of Teaching Excellence in 2009, a Cady Award for distinguished service from the Professional Dairy Heifer Growers Association in 2003, and an Honors Award – Southern Branch from the American Dairy Science Association in 1999. James received his bachelor’s degree from the University of Delaware and a master’s degree and Ph.D. from Virginia Tech. Leigh-Anne Krometis,, Dumitru Branisteanu, and Alan Grant. Congratulations to the September Employee of the Month – Dumitru Branisteanu, field research technician from the Department of Biological Systems Engineering. “The field component of this multi-year project was particularly ambitious. Dumitru managed to help us to meet all project deadlines and improve our study design. Most importantly, he was never too busy to slow down and teach the students how to do the work safely and correctly. Working side by side, we managed to get our vegetables in this growing season with barely a bruised knuckle, despite working with heavy equipment. As the September Employee of the Month, Dumitru received a plaque, gifts from the college, has his photo displayed in the case in Hutcheson Hall, will be featured in an article in Insights and will be eligible to be considered for the 2016-17 Employee of the Year award. (From left to right top) Dwight E. Houff, Robert W. Manly. (From left to right bottom) Richard G. Saacke, Max James Tappero. 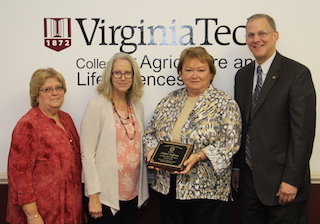 Four distinguished industry leaders were inducted into the Virginia Livestock Hall of Fame at 10 a.m., Sept. 24, at the Alphin-Stuart Livestock Teaching Arena. The ceremony featured the unveiling of the honorees’ portraits, which will hang in the arena gallery alongside those of 55 other prominent industry leaders who have been recognized for their contributions to the Virginia livestock industry. “The Livestock Hall of Fame allows Virginia’s beef, sheep, dairy, pork, and horse industries to recognize those who have made outstanding contributions to the commonwealth’s livestock industry,” said Ike Eller, a retired Virginia Cooperative Extension animal scientist who chairs the hall of fame committee. Dwight E. Houff, of Mount Sidney, Virginia, a 1961 Virginia Tech alumnus, who excelled as a breeder of Angus, Hereford, and Gelbvieh cattle and served in many leadership and service roles in Virginia’s beef industry. He was recognized as Virginia Cattleman of the Year in 1993 and was named Virginia Seedstock Producer in 2002. His leadership in church, business, and community affairs is equally noteworthy. Robert W. Manly, of Waverly, Virginia, who orchestrated the development of the vertically integrated pork strategy in the state. It was his vision that led to the development of swine production operations, feed milling operations, and the successful expansion of packing operations in Smithfield, Virginia. The employees, local businesses, farmers, and the communities in which Smithfield Foods operate in Virginia and elsewhere are grateful for his contributions to the pork industry. 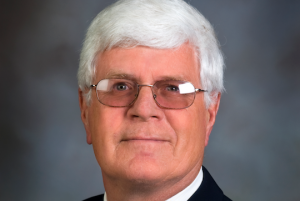 Richard G. Saacke, of Blacksburg, Virginia, a Virginia Tech professor emeritus of dairy science, was an enthusiastic contributor to the Virginia, national, and international livestock communities through his research, graduate and undergraduate teaching, and extension efforts. He served as a professor of reproductive physiology during his 44-year professional career, with 36 of those years at Virginia Tech. He continues to provide guidance to students and the livestock industry. Max James Tappero (1929-2003,) of Lynchburg, Virginia, influenced Virginia’s horse industry as a horseman and an ambassador who established and enhanced the horse as a major contributor to Virginia agriculture. He galvanized the commonwealth’s horse industry by bringing stakeholders together to ensure a solid foundation for the equine industry. In 2014 he was inducted into the Virginia Horse Show Association Hall of Fame. 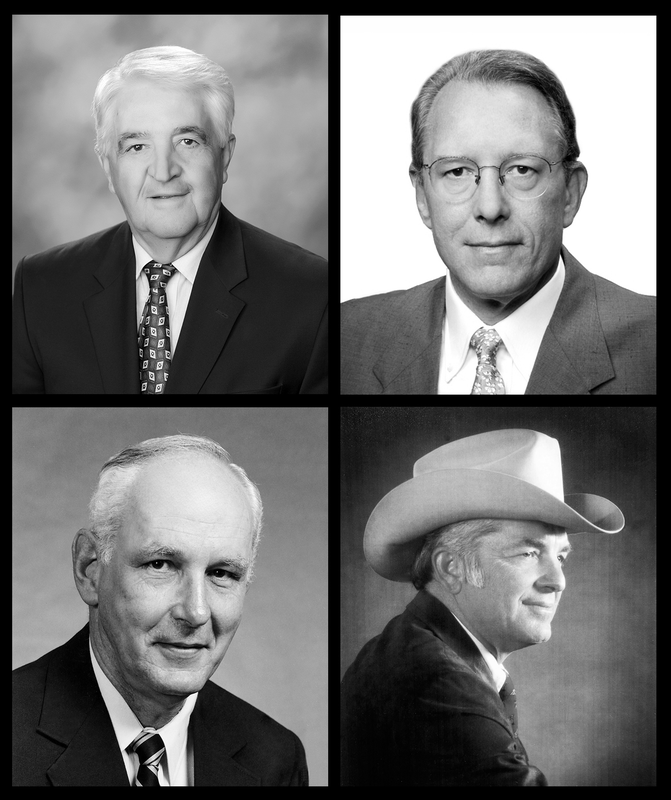 Established in 2009, the Virginia Livestock Hall of Fame bestows honor and recognition on outstanding Virginians who have made significant contributions to the state’s livestock industry and its people. The Virginia Cattlemen’s Association, Virginia Pork Council, Virginia Sheep Producers Association, Virginia State Dairymen’s Association, and the Virginia Horse Council have the opportunity to nominate living or deceased individuals to the Virginia Livestock Hall of Fame. 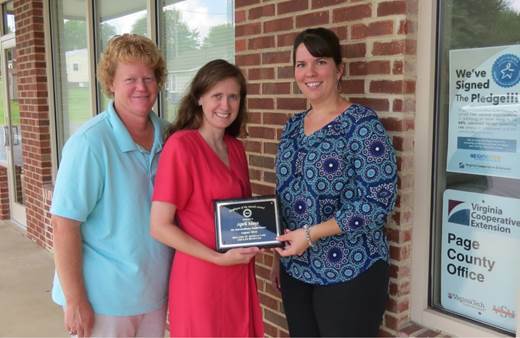 Congratulations to the August Employee of the Month – April Mays – administrative assistant from Page County Virginia Cooperative Extension! “A neighboring county lost their unit administrative assistant very unexpectedly in the fall of 2015, April Mays was asked to help with the finances until a replacement could be hired. Taking on this task was in addition to her normal responsibilities in the office. She has worked diligently over the past few months to reconcile reports and get the finances in order for the new hire. April is even assisting with training the new support staff member and is serving as her mentor. April is known in our district as a “go-to” person. W hen other unit administrative assistants have questions they often seek April’s guidance. As the August Employee of the Month, April received a plaque, gifts from the college, has her photo displayed in the case in Hutcheson Hall, will be featured in an article in Insights and will be eligible to be considered for the 2016-17 Employee of the Year award. The University’s Annual Faculty and Staff Awards Banquet was held on August 28th. Among the award recipients were several individuals from the College of Agriculture and Life Sciences. Nada Tamim, director of undergraduate programs for the Department of Animal and Poultry Sciences, received the Award for Excellence in Undergraduate Academic Advising. Retired programmer in the Department of Crop and Soil Environmental Sciences Ted Ellmore received the Staff Career Achievement Award. Alex Niemiera, professor of horticulture, was the 2016 recipient of the William E. Wine Award for excellence in teaching. Stephen Hopkins, Virginia Cooperative Extension Agriculture and Natural Resources agent in Central District, and David Close, a consumer horticulture Extension specialist and state Master Gardener coordinator received the Alumni Awards for Excellence in Extension in the agent and specialist category, respectively. Jim Westwood, a professor in the Department of Plant Pathology, Physiology, and Weed Science, was recognized for his pioneering contributions to genomics research aimed at understanding how parasitic plants manipulate their hosts and cause devastating crop losses. Mike Zhang, professor of biological systems engineering in the College of Engineering and College of Agriculture and Life Sciences at Virginia Tech, has been awarded the Elizabeth and James E. Turner Jr. ’56 Faculty Fellowship in Engineering by the Virginia Tech Board of Visitors. Elizabeth and James Turner created the Turner Fellowships in 2011 with a $1 million gift to recognize faculty excellence. James Turner is a 1956 agricultural engineering alumnus who is the retired president and chief operating officer of General Dynamics. He is also a former rector of the Virginia Tech Board of Visitors, and in 2004 received Virginia Tech¹s highest honor, the William H. Ruffner Medal. Recipients hold the title of Turner Fellows for a period of five years. A member of the Virginia Tech faculty since 2001, Zhang’s research program focuses on development of safe and effective vaccines or therapeutics to combat existing and emerging human and livestock diseases with particular expertise is the development of delivery mechanisms for vaccines and therapeutics that improve their effectiveness. His research has attracted significant funding from federal agencies, including the National Institutes of Health and U.S. Department of Agriculture, and from industry. Zhang is active in the American Society of Agricultural and Biological Engineers, having completed the officer progression for the Biological Engineering Division of ASABE. He reviews proposals, serving on panels for several federal agencies. He reviews manuscripts for a variety of high quality journals has served on the editorial boards of two journals. In the classroom, Zhang is regarded as an excellent teacher, contributing significantly at both the undergraduate and graduate levels through teaching courses, leading continuous improvement efforts, and mentoring both undergraduate and graduate students. Through his leadership as graduate program director, he has contributed significantly to increasing the quality and number of graduate students in the biological systems engineering program. Zhang received his bachelor’s degree from University of Science and Technology, Beijing, China, and a master’s degree and a Ph.D. from Iowa State University. David Dunaway has not shied away from new tasks in the 17 years he has been an agricultural technician at the Eastern Virginia Agricultural Research and Extension Center. During that time he has learned, grown, and taken on more duties at a higher level than he was originally hired for. Dunaway received the employee of the year award at the CALS picnic. Travis Mountain, assistant professor of agricultural and applied economics in the Virginia Tech College of Agriculture and Life Sciences and Virginia Cooperative Extension specialist, has received two national awards for his outstanding work that examines family and consumer finances. Mountain was presented the 2016 Robert O.Hermann Ph.D. Dissertation Award and the AARP Public Policy Institute’s Financial Services and the Older Consumer Award, both from the American Council on Consumer Interests. His area of concentration is the financial and economic well-being of the households and communities of Virginia. His research interests include life insurance adequacy, food security, and mortgage selection decision behavior. ACCI is the leading consumer policy research and education organization consisting of a world-wide community of researchers, educators, and related professionals dedicated to enhancing consumer well-being. Mountain received his bachelor’s degree in consumer science and his master’s degree in consumer behavior and family economics from the University of Wisconsin-Madison, and his Ph.D. in family resource management from Ohio State University. He has been a faculty member and Virginia Cooperative Extension specialist in Virginia Tech’s College of Agriculture and Life Sciences since the fall of 2015. He is also a member of the NC 2172 multistate research team focusing on “behavioral economics and financial decision making and information management across the lifespan.” The team is currently working on a post-secondary education financing project and has future plans to examine Social Security and retirement. He is the recipient of the Ruth Jane Yauger Scholarship 2014-2015 and placed third in the Hayes Forum Research Competition in 2014. He is a member of the American Council of Consumer Interests and the Academy of Financial Services.